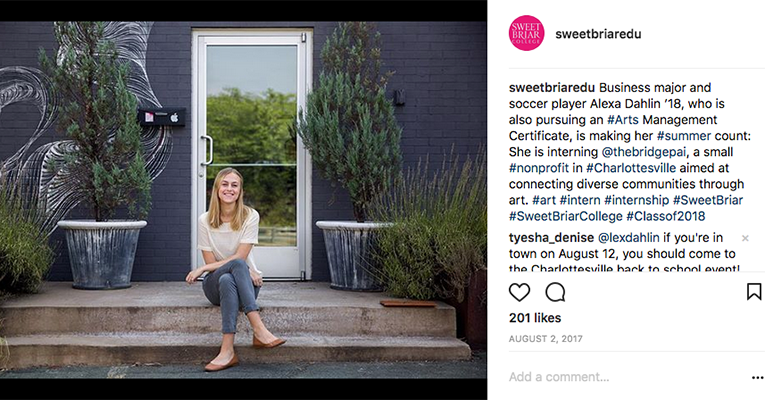 Thanks to the Friends of Art, recent Sweet Briar grad Alexa Dahlin ’18 didn’t have to look far to find her dream internship. 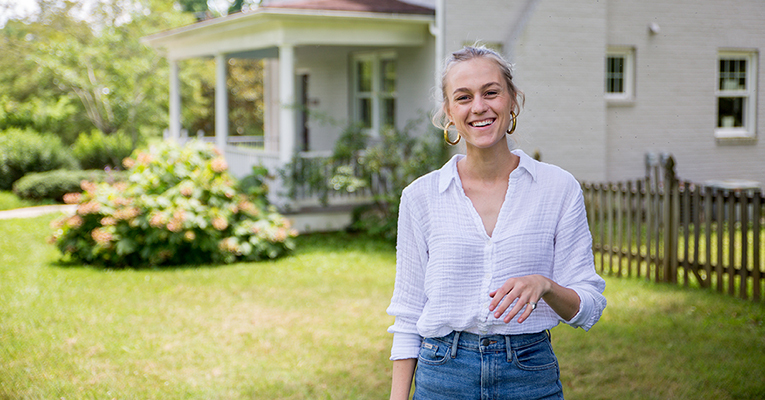 Dahlin is the first recipient of the organization’s graduate internship at the Virginia Center for the Creative Arts, an international artists’ colony adjacent to campus. 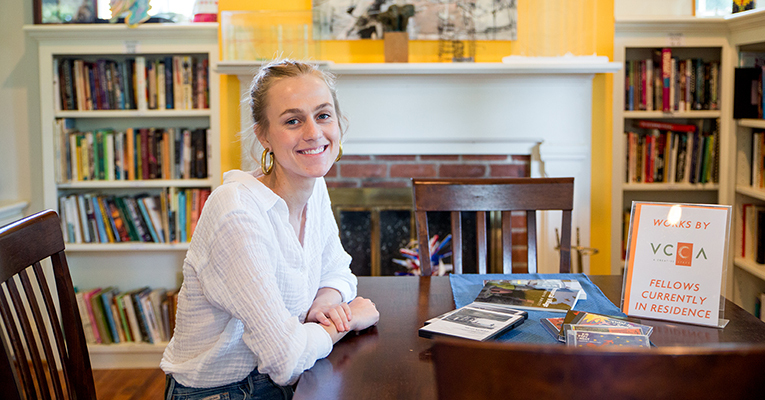 A $5,000 stipend allowed the former business major with an Arts Management Certificate to spend 10 weeks this summer working on a number of projects with VCCA staff. One of them: developing a plan and strategy for the VCCA’s upcoming 50th anniversary in 2021. A big chunk of her time has been spent compiling the center’s history. 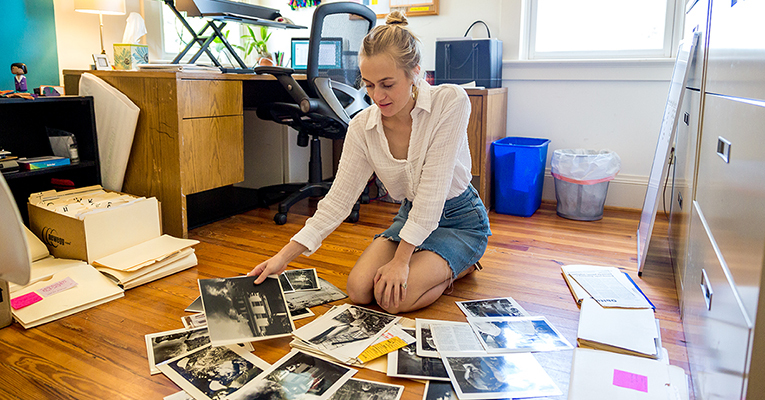 Sorting through old photographs that document the VCCA’s history is a fun part of Dahlin’s internship. She’s also worked with Kirsten McKinney, the VCCA’s director of communications, on several other projects, including, as McKinney put it, “magically” organizing a “tremendous backlog of processed applications,” posting fliers around town, helping out with the VCCA’s Open Studios in July and with day-to-day operations such as greeting fellows in the office, sitting in on staff meetings and keeping track of entries to the VCCA’s annual Instagram contest. On Aug. 10, Dahlin will wrap up what is internship number five since she started — and finished — her undergraduate career. Among them: an accounting firm, a children’s museum, a nonprofit arts organization and a fashion merchandising firm. It’s no surprise the judges for the Friends of Art Graduate Internship award were impressed, and they felt Dahlin deserved to be rewarded for her dedication. 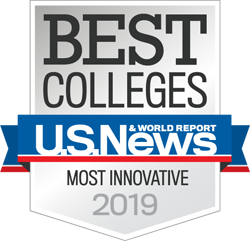 “Alexa demonstrated an impressive track record throughout her undergraduate career of commitment to arts organizations,” wrote Carrie Brown, professor of English and creative writing and director of the Center for Creativity, Design and the Arts at Sweet Briar. Also on the jury were Barb Watts, director of career services, and FOA board member Celeste Wackenhut ’08, who also interned at the VCCA after graduating from Sweet Briar. A former VCCA fellow herself, Brown has cultivated strong ties between the VCCA and the College during her two decades at Sweet Briar. Under her leadership of the Center for Creativity, Design and the Arts — and as part of the College’s new academic calendar — there will be even more opportunities for collaboration between the neighbors, including monthly evening salons held in the Reheard Gallery of Mary Helen Cochran Library, when VCCA fellows share their work with the Sweet Briar community. And next spring, one section of one of Sweet Briar’s core classes — Expression and the Arts — will be co-taught by a cross-genre team of VCCA fellows working across artistic disciplines. Brown expects some very exciting applications to emerge from that call for proposals. Just four days after graduation, Dahlin flew to Minnesota to undergo invasive thoracic surgery at the Mayo Clinic. She’s recovered well since then, but has had to put life on hold — for a little while. “After I complete my internship at the VCCA, I am looking to move south — either Birmingham or Atlanta — and work in development or marketing in the nonprofit sector,” she says. With a résumé like hers, that next step should be easy.